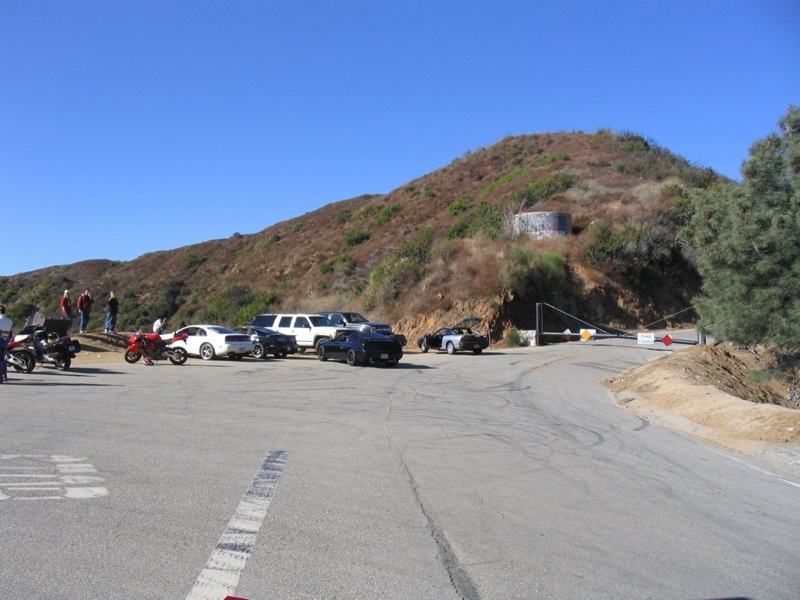 Glendora Mountain Road (GMR) is a well-known mountain road in Southern California, with 13.22 miles of tarmac extending north from the city of Glendora into the San Gabriel Mountains. The tarmac is generally of high quality without many potholes, as it lies at a low enough elevation to avoid major snowfall and ice for all but a handful of days a year. Those familiar with GMR refer to the roads two sections as Frontside and Backside. Frontside is the southern section of the road, which starts in Glendora and ends at the intersection with Glendora Ridge Road (GRR). This section is 8.36 miles from gate to gate (the gates being close to the ends of the road). These gates are often used to record one’s time on the road. The other section is located in the north, and starts at Horse Canyon Saddle where GMR meets GRR, and terminates where it meets East Fork Road in the north. This section is 4.86 miles long from gate to sign, with the sign being near the saddle. The default rest area on the road is Horse Canyon Saddle, which I personally refer to as just ‘the Saddle’. I believe most people just call it “the meeting spot” or what-have-you. Folks congregate here after driving or riding either portion of the road and often discuss driving or cars with those parked there. It’s typically a friendly atmosphere reminiscent of a car show, but with the added advantage of having a beautiful road to drive on and enjoy. Basic overview (uphill): Turn one runs over a bridge and presents the driver with a short straight (approx. 400m) into turn two, a decreasing-radius right-hander. A series of five 180 degree hairpins leads to the second decreasing-radius turn and another hairpin. I refer to the next turn as ‘the Carousel’, which is cambered to the inside. This turn has an excellent exit when run downhill. Next is a straight to the ‘Bridge Turn’, a medium right over a reinforced section of road that washed out badly around 2005. Next is a slightly tighter left into a right to an easy straight into ‘Quick Clip’, a very quick and rewarding turn with a jump. Following is the ‘Hunter Straights’, a long 760m straight where you pass the entrance to Glendora Ridge Motorway (gated – gravel). Transition to a fast left-right-left into a tight right over small crest. Next is a series of medium-slow turns with short straights mixed in. There is a major paved turnout on the left with a trashcan, which is named ‘Newman Point’. This is often the site of automotive photography and commercials. A tight right brings you to more turns of similar character, though generally tighter than the ones south of Newman Point. Shortly afterwards you come to a tight right downhill turn, which puts you onto a series of fast turns that can be linked as a straight. Following that is a series of straights atop a ridge that are easy to link and cover very quickly. You’re heading uphill when you get ot the next right, which warns you to slow down with its character. The next turn tightens and you’re running through more turns much like the ones you passed earlier. Three tight turns with excellent camber follow. Watch for the drainage gates on the inside of the turns. The last turn smooths out and you’re faced with a tight right into a low-speed sweeper of sorts into a tight left decreasing-radius turn next to a gated Maintanence yard. Runout for those who don’t get it right it is a gravel turnout. A short straight into a right leads to an uphill straight and over a hill. The road begins to head downhill steeply, and you are faced with three tight turns which end at the gate and the Saddle. Backside is the most popular section for enthusiasts, with its constant turns, excellent tempo, and character. Lots of folks time their runs on this section of GMR, and a good downhill time on this section in an ‘average’ production car is in the 5-5:30 range. Smartly-modified cars can run times below the 4:45 mark. 4:45 has yet to be achieved by anyone – 4:51 is the current record by a AE86 Corolla on NT01 driven by a old timer.